Looking for Custom personal family hand painted poster painter .Want to create Customized posters for family in bollywood style !.Here is a solution, Bollywood posters studio with highly talented and experience oil school artist available . Don’t need to go here and there, just sit at home and order online at Bollywood posters studio. You just need to select your favorite movie and send it along with your hd photos at our email id : bollywoodpostersstudio@gmail.com . Or can contact us on : +919022034923. 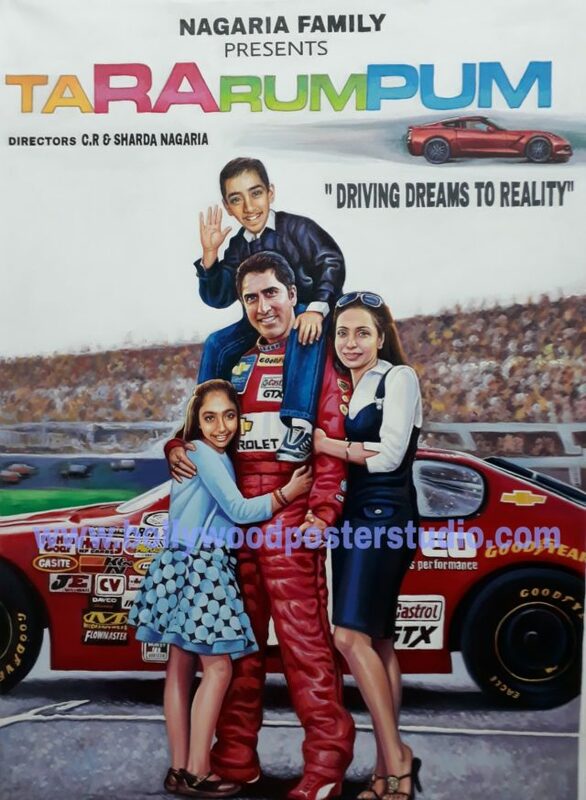 And we will design your very own customized family portrait into bollywood poster based on the same. Celebrate the joy of togetherness by commissioning a hand painted Customized posters for family in bollywood style that will serve as a lifetime keepsake in your family. A fun experience for all your family members, your very own Customized posters for family in bollywood style will preserve your joyous memories forever. Bollywood posters studio offers fully Customized posters for family in bollywood style to suit the unique requirements of all of your family members involved. These magnificent works of art are created by the last few surviving Bollywood poster artists remaining in India. What you are seeing here is not a digitally created spoof poster but a 100% hand painted customized Bollywood poster. Painstakingly created on canvas using a blend of absolutely permanent oil colors, our customized Bollywood posters come with a lifetime guarantee on colors. Our expert team comprising old school Bollywood poster artists can create virtually any customized Bollywood posters for your family , friends, relatives ,love one on canvas according to your unique needs and will become centre of attraction at your home.Your wonderful memories of togetherness will remain captured in your customized family Bollywood poster in truely filmy style. Highly accurate and realistic, our customized Bollywood posters are unique works of art that you can treasure for a lifetime. Starting from a humble pencil sketch, you can see your customized family portrait into Bollywood poster come alive in oil colors in a step by step transformation!. Don’t miss this once in a lifetime opportunity to get customized family portrait into bollywood posters made for your family – all from the comfort of your home!. Accuracy and resemblance in faces is critical to the success of any customized Bollywood poster and we strive to deliver absolute perfection in our work. we deliver poster only after your complete satisfaction and approval .Every thing will be according to you. Order now !.. Just need to call us on mobile no : +919022034923 .